At Valley End Infant School we recognise that pupils of our school may have medical conditions ranging from minor to complex, short term and long term. We are dedicated to ensuring that the care and provision for these children is always of the highest quality, enabling every individual to participate fully in all aspects of school life. Most pupils should be able to attend school regularly with the implementation of their personal medical care plan. It is our belief that partnership is vital to achieving and implementing this and so we aim to collaborate extensively with parents and all relevant parties to ensure that we have the necessary care information, provision and training to offer an inclusive and safe educational experience for our pupils. This policy outlines the care provision and systems at Valley End Infant School for those children who have medical conditions so that they can access, participate and enjoy school with their peer group. We welcome the Department for Education statutory guidance ‘Supporting Pupils at School with Medical Conditions’ which also informs this policy and our practice. • Ensure that their child is well enough to attend school and if not, children should be kept at home when they are unwell. If a child vomits or has diarrhoea, then they should not attend school until 48 hours from the last instance of vomiting or diarrhoea. The governing body will ensure arrangements are in place to support pupils with medical conditions so that they can access and enjoy the same opportunities at school as any other child with sufficient financial allocation to support resourcing and training necessary. Governors will ensure that there is sufficient funding available to support resourcing and any training necessary. The Headteacher is responsible for implementing this policy in practice, ensuring that teachers receive proper support and training where necessary. Day to day decisions about administering medication will normally fall to the Headteacher. The Headteacher is also responsible for making sure parents are aware of the school’s policy and procedure for dealing with medical needs. The Headteacher is responsible for arranging back-up cover when the member of staff responsible for a pupil with medical needs is absent or unavailable. The SENCDo is responsible for liaising with parents in the identification and provision for additional medical needs that are related to the pupil’s special educational needs. If a child requires a medical care plan and an educational health care plan, the SENDCo will coordinate the child’s needs with associated professionals to ensure the appropriate provision is identified and in place. Staff responsible for pupils with medical needs in their class will be familiar with the child’s personal medical plan, understanding the nature of the condition, and when and where the pupil may need extra attention. They will be made aware of the likelihood of an emergency arising and what action to take if one occurs as outlined on the medical plan. If it is agreed between both parents/carers and staff that staff are to administer medication, they may only do so if they have had appropriate training, and the appropriate permissions have been received. Mrs Louise Caldwell Special Educational Needs Disabilities Coordinator (SENDCo) – Parent liaison, staff training, professional liaison and first aider. Mrs Pauline Critcher, Mrs Clare Pool and Mrs Anne Wright – Office Staff Parent liaison: processing of information regarding pupil admissions, first aiders, induction and personal details. Production and distribution of Pupil Medical Care Plans to necessary staff and locations (e.g. first aid areas ). Administration of medicines to pupils after parent or carer has completed a medical consent form. On entry to our school or at the point of medical diagnosis (whichever is sooner), the following chart illustrates the process of information sharing which will be followed. This enables a medical care plan to be drawn up and implemented in readiness for the child’s immediate care at school. 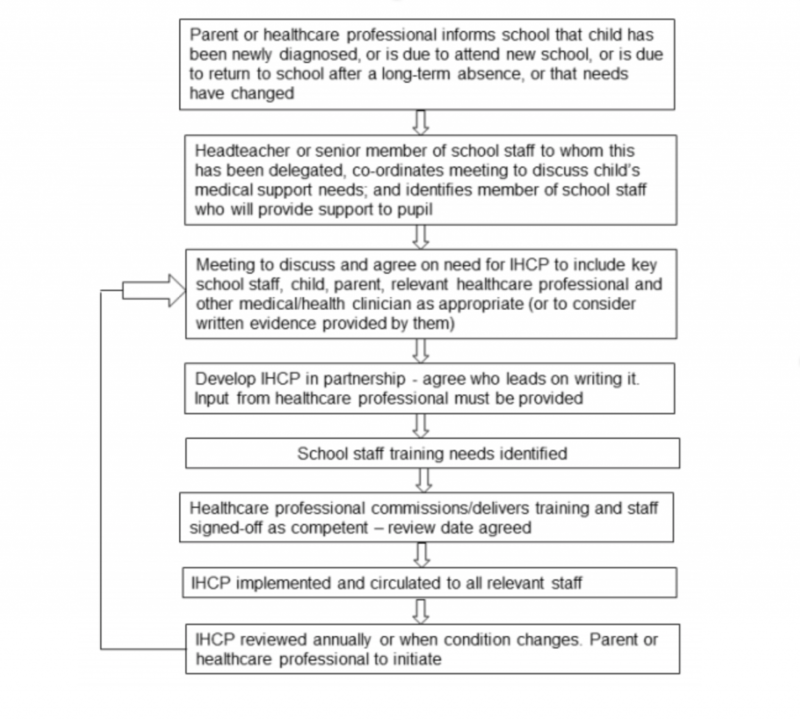 At confirmation of the medical care plan (IHCP – Individual Health Care Plan), parents/carers and the Headteacher will be required to sign this document to acknowledge the provision agreed. For pupils with Asthma, we use a medical care plan as described above. For new pupils to the school, or following a period of health related absence, we will also determine, through discussion with parent/carers and professionals, the relevant induction and/or transition plan into school as required for the child in accommodating their health needs. As part of their Individual Health Care Plan (IHCP) some pupils may require intimate medical care. Staff must be fully trained by a Children’s Clinical Trainer to undertake any intimate medical procedures and must be ‘signed off’ by the trainer once fully trained. Trained staff must undertake any intimate medical care procedures with one another member of staff and must keep clear records of when any procedure takes place. Records will be shared with the parent and kept with the pupil’s medical equipment. The Headteacher, SENDCo, Class Teacher and any relevant Learning Support Assistants will work in partnership with parents and carers to ensure that the pupil’s medical, physical and emotional needs are fully met. Should a child require medical care or to complete a course of prescribed medication for a short term illness, from which they have recovered to a point of being well enough to return to school and/or beyond Health Agency recommended absence time e.g. : tonsillitis with prescribed penicillin or broken limb, we will request that parents discuss their care plan requirements with the school. This will involve an informal discussion and completion, if necessary, of a medication consent form. This authorises the identified school staff to administer named prescribed medication for the child during the hours of the school day, under the consent of the parent/carer. Where possible, parents will be encouraged to administer the medicine outside of school hours. Parents are responsible for the delivery and collection of medicines from the school office. For short term medication (i.e. a course of antibiotics) these must be collected daily. For longer term medications held at school, these must be collected at the end of each term. Parents are responsible for ensuring that their child’s medication is in date and also for the disposal of date-expired medicines. Pupils are involved in the preparation of their medical care plan where able. We invite the child to take responsibility in implementation of their care plan if they are able. We encourage them to play an active part in the communication of their needs or changes in their well-being and personal organisation in readiness for required medicine administration or health related activity. Any medication stored on school premises following consent of the parent/carer and Headteacher, will be stored securely in the appropriate location. If necessary, this may include refrigeration in a locked fridge that is situated in the school office. All medication will be officially labelled to the named recipient, and must be accompanied with signed authorised medical consent form explaining details of practitioner advice/prescription dosage. In most cases this means being locked in medication cabinet. However there may be some medication which will be stored more accessibly due to the frequent nature of need e.g. inhalers or diabetic kits. In all cases it will be stored in such a way as to not pose risk or misuse by another person, under the supervision of the responsible staff member. All medication administered will be recorded upon the child’s medication log. This ensures the monitoring of administration and details, to ensure transparency and diligence as well as assisting in communications with parents or professionals as needed. Staff will complete and sign record log each time they give medication to a pupil. In such circumstances, wherever possible, the dosage and administration will be witnessed by a second adult. If pupils can take their medication themselves, staff will supervise this, bearing in mind the safety of other pupils. Written parental consent is necessary for this. If a child requires three doses of medicine, parents will be encouraged to give the doses at home during breakfast time, after school and then at bedtime. If a child refuses to take medication, the school staff will not force them to do so. The school will inform the child’s parents as a matter of urgency. If necessary, the school will call the emergency services. Allocated staff have regular training in First Aid and know how to manage an emergency situation including calling the emergency services. A pupil taken to hospital by ambulance will be accompanied by a member of staff until the pupil’s parents arrive. Parents are requested to notify school as soon as possible of any changes to the necessary provision or presentation of the medical condition within the child. Staff noting any changes are to discuss this at a formal meeting with parents and the SENdCo. Adaptations to the care plan will be facilitated and implemented as an outcome of the meeting, with the amended care plan being drawn up, signed and replacing the previous plan. Children with medical needs will be encouraged to take part in all subjects and available activities. Any special adaptations or restrictions on a pupil’s ability or capacity to participate in such activity will be included in their provision plan. Or in the event of a temporary/short term need, this should be communicated in writing by their parent/carer. Some pupils may need to take precautionary measures before or during exercise and/or need to be allowed immediate access to their medication if necessary. Teachers should be aware of relevant medical conditions, care plans and medication/emergency procedures. Staff organising and/or supervising excursions should be aware of any medical needs, and relevant emergency procedures. These will be considered as part of the excursion risk assessment and evaluation, during the preparation of the trip to ensure that the visit is viable for all pupils. When needed, an additional trip supervisor will be allocated to accompany a particular pupil with specific needs to ensure the implementation of their care plan whilst off-site. If necessary, a discussion meeting will be held by the staff and parent/carer to ensure that the child’s medical care plan can transfer and apply to the off-site event and location. On some occasions this may lead to the drawing up of an additional temporary care plan tailored to the event or activity. If staff are still concerned about whether they can provide for a pupil’s safety, or the safety of other pupils on a trip, they will seek medical advice from the School Health Service or the child’s G.P. with the ultimate aim of ensuring the event is inclusive for all pupils. The sharing of medical care plans will be agreed with parents/carers enabling the staff to ensure that responsible staff, including support staff or supply teachers, have access to care plans. All sensitive/detailed information will be handled with the appropriate regard for confidentiality of pupils’ personal details and self-esteem. At all times our philosophy of inclusion and confidentiality will remain paramount, so as to be sensitive to the child’s self-perception, and protect the individual from vulnerabilities or isolation from their peers. In accordance with parent/carer and individual wishes the school will, as appropriate, offer the option of ‘peer awareness sessions’ so that the child’s peer group and wider staff body understand individuals’ additional needs, and can support each other in achieving inclusion and equality of opportunity. We will always treat every child and their medical needs as individuals with bespoke provision in response to their needs. We will not make presumptions in the care of any pupil and will always judge each case as the individual that it is, in line with medical practitioners’ guidance and training. • prevent children from participating or create unnecessary barriers to children participating in any aspect of school life, including school trips, e.g. by requiring parents to accompany the child. The school’s insurance policy is operative with QBE Insurance (Europe) Ltd. This provides liability cover relative to the administration of medications. Section 21 of the Education Act 2002 provides that governing bodies of maintained schools must, in discharging their functions in relation to the conduct of the school, promote the wellbeing of pupils at the school. Section 175 of the Education Act 2002 provides that governing bodies of maintained schools must make arrangements for ensuring that their functions relating to the conduct of the school are exercised with a view to safeguarding and promoting the welfare of children who are pupils at the school. Section 3 of the Children Act 1989 provides a duty on a person with the care of a child (who does not have parental responsibility for the child) to do all that is reasonable in all the circumstances for the purposes of safeguarding or promoting the welfare of the child. Section 17 of the Children Act 1989 gives local authorities a general duty to safeguard and promote the welfare of children in need in their area. Section 10 of the Children Act 2004 provides that the local authority must make arrangements to promote co-operation between the authority and relevant partners (including the governing body of a maintained school, the proprietor of an academy, clinical commissioning groups and the NHS Commissioning Board) with a view to improving the wellbeing of children, including their physical and mental health, protection from harm and neglect, and education. Relevant partners are under a duty to co-operate in the making of these arrangements. The NHS Act 2006: Section 3 gives Clinical Commissioning Groups a duty to arrange for the provision of health services to the extent the CCG considers it necessary to meet the reasonable needs of the persons for whom it is responsible. Section 3A provides for a CCG to arrange such services as it considers appropriate to secure improvements in physical and mental health of, and in the prevention, diagnosis and treatment of illness, in, the persons for whom it is responsible. Section 2A provides for local authorities to secure improvements to public health, and in doing so, to commission school nurses. Section 2 of the Health and Safety at Work Act 1974, and the associated regulations, provides that it is the duty of the employer (the local authority, governing body or academy trust) to take reasonable steps to ensure that staff and pupils are not exposed to risks to their health and safety. Under the Misuse of Drugs Act 1971 and associated Regulations the supply, administration, possession and storage of certain drugs are controlled. Schools may have a child who has been prescribed a controlled drug. The Medicines Act 1968 specifies the way that medicines are prescribed, supplied and administered within the UK and places restrictions on dealings with medicinal products, including their administration. Regulation 5 of the School Premises (England) Regulations 2012 (as amended) provide that maintained schools must have accommodation appropriate and readily available for use for medical examination and treatment and for the caring of sick or injured pupils. It must contain a washing facility and be reasonably near to a toilet. It must not be teaching accommodation. Section 19 of the Education Act 1996 (as amended by Section 3 of the Children, Schools and Families Act 2010) provides a duty on local authorities of maintained schools to arrange suitable education for those who would not receive such education unless such arrangements are made for them. This education must be full time, or such part-time education as is in a child’s best interests because of their health needs. EpiPens are used to administer and auto inject adrenaline to pupils who may be at risk from a severe allergic reaction or anaphylactic shock. For any pupils who have been prescribed an EpiPen, one EpiPen is kept in the classroom and one EpiPen is kept in the school office. Parents must supply both EpiPens and then renew them when are out of date. EpiPens are also taken on school trips and onto the school field. The school may hold a spare EpiPen for emergency use. However, parents must not rely on there being a spare EpiPen in school and should renew their child’s EpiPens as appropriate. • During a period of reduced supply of epi pens, 300mcg of adrenaline can be prescribed to children weighing 25kg or above, even where the pen might state 30kg or above. • In the event of anaphylaxis during a period of short supply of epi pens, if a child has no in-date pen, an out-of-date pen can be used. Using an out-of-date pen might give a lower dose of adrenaline but it is better to use an out-of-date pen than wait for an ambulance to arrive. In the event of parent/carer dissatisfaction, we advise individuals to follow school procedure as outlined in the school’s Complaints policy. This entails, having an initial conversation with the class teacher, SENdCo or the Headteacher to express their concerns or worries, in anticipation of reaching a solution.